Not to be confused with Neo Bowser Castle. Neo Bowser City (known as Koopa City in the British English version) is the third course of the Star Cup in Mario Kart 7. It is a neon-lit city-themed course themed after Bowser, the only track of this sort to not be a version of Bowser's Castle. Neon signs are everywhere and images of Bowser himself and his signature emblem can be seen in various places. Neo Bowser City is the second course in the Mario Kart series that is placed entirely in the rain, the first being Luigi Circuit from Mario Kart: Super Circuit. Neo Bowser City also appears as a retro track in Mario Kart 8 and Mario Kart 8 Deluxe. In these games, it is the first track of the Bell Cup, a cup that comes with the Animal Crossing x Mario Kart 8 add-on content pack for the original Mario Kart 8. This course takes place in a brightly lit city in the rain. A large percentage of the course is winding roads with moving neon arrow railings. There is a small upward spiral section in the middle of the track that goes up a tower. Traction is decreased due to the rain. There is a tunnel close to the end of the course, that leads to a road that is covered with puddles. A Glide Ramp then appears just before the end. A billboard is seen near it with a picture of either Bowser (said picture is his artwork from Mario & Sonic at the Olympic Winter Games), the player's view, or an animated "Overtake" ad from Toad Circuit. If gliding players veer left (right in mirror mode) from the starting line, they can fly over a Koopa Clown Car with a fan to give them lift enough for the first bend; in higher engine classes, however, they must steer back quickly to avoid hitting the wall. The course starts with an S-bend; however, players must steer back in quickly to avoid hitting the wall. Just before the player enters the air vent area, it is possible to be pushed through the guardrails by a heavier opponent. After that, the race continues under a tower with air ducts. Then there are two soft turns and a red tunnel. After many turns, the player exits and reaches the winding part of the road, which consists of three hairpin turns. Then, there is a shorter tunnel that leads to a road all to the left, that is covered with puddles. At the end, there is a glider ramp back to the finish line. After the S-bend, players can cut through the mud with a Mushroom. They must steer back in quickly to avoid hitting the wall. Near the finish line, if players use a Mushroom or the Koopa Clown Car air current, they can glide into a secret zone on the S-bend under the red tunnel. Neo Bowser City returns to Mario Kart 8 as a retro course in the second DLC pack Animal Crossing × Mario Kart 8 and as part of the base content of Mario Kart 8 Deluxe. It is the first track of the Bell Cup. 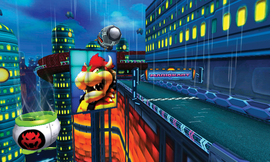 The city background is given an overhaul in design, featuring a glass tunnel where anti-gravity vehicles are driving in, and with more distinctive architecture, instead of having mushroom hills on the far background. The start and finish banner has been redesigned, featuring hexagon patterns behind the Mario Kart logo, and on the two neon pillars (previously one) supporting the banner. It is also possible now to hit the banner, like in Mario Circuit and DS Wario Stadium. The new Bowser insignia that is now used in this course is also modeled around a hexagon. The blimp with a screen on it has been removed. Billboards now show an animated picture of the name of the course, along with Bowser in it, instead of displaying an ongoing video of the player's point of view, an animated ad, and a still picture of Bowser. The rails with scrolling neon arrows have been redesigned into neon rails with light arrows on top of them. The overall course layout is unchanged, but has received a few minor modifications. A drop-off has been added at the entrance to the tunnel in place of a downhill slope. The three-quarter turn into the glider ramp at the end has been modified into an anti-gravity section, complete with spin boost pillars, while the water puddles have been removed. The Koopa Clown Car air current found near the S-Bend has been moved to behind the banner, instead of beside it. The music is also roughly the same, similar to 3DS DK Jungle and Wii Grumble Volcano, but an electric guitar has been added. Bowser's minions - Koopa Paratroopas, Dry Bones, Hammer Bros., Fire Bros., and Boomerang Bros. are spectators for this course. In addition, like in the rainy courses in Super Mario 3D World, rain drops flow down the screens of both the GamePad and the TV, just to add a minor effect. Like with the turn after the S-bend, it is now possible to use a Mushroom or Star to cut through the mud on the anti-gravity segment. In Mario Kart 7, the staff ghost for this track is Metal Mario. In Mario Kart 8, the staff ghost for this track is Dry Bowser on the Bone Rattler, with a time of 2:09.513. In Mario Kart 8 Deluxe on 200cc mode, the staff ghost is Bowser. French Koopapolis An aggregation of "Koopa" and "metropolis"
Some of the buildings found in this course are based on the dome hills from the grasslands in the mainstream Mario games. In Mario Kart 8 the signs and animation of Bowser with the name of the course display the text "Neo Bowser City" even in non-American versions where the name of the course is different. This is the same in 3DS Music Park (called "Melody Motorway" in the British English version). This track is one of three courses in Mario Kart 8 where the starting banner can be crashed into by playable characters via hang-glider. The other two courses are Mario Circuit and DS Wario Stadium. However, the banner for this track spins when hit, whereas the other aforementioned track's banners only swing. When exiting the tunnel in the Mario Kart 8 version of the track, a spotlight with Bowser's emblem points to the sky, possibly referencing the Batman spotlight (called the "Bat Signal") in the Batman series. The track's music is a mashup of several other music tracks: the theme from Toad Circuit and Mario Circuit, the title theme of Mario Kart 7, the theme from Mario Kart Wii's Luigi's Circuit and Mario Circuit, and the theme of Mario Kart 64's Toad's Turnpike. The theme was reused in the arrangement entitled "Circuit (Mario Kart 7)" from Super Smash Bros. for Wii U. This page was last edited on April 15, 2019, at 14:53.